Invent a Sport, Horney Toad at it again! Horny Toad has been done a lot of thinking and produce great clothing, so when they sponsor a contest like Invent a Sport people come out of the woodwork. There are things like Special Sumo Wrestling, Crazy Biking and WiFi Hunting, all these are doable some just a little more crazy then the next. Hey who would have thunk the XGames would have come as far as they have even getting sports like BMX into the Olympics. There are hundreds of sports out there with well-defined rules to follow (boring), but we here at Horny Toad, along with the good folks at Instructables, think rules are made to be broken. Horny Toad's mantra, "Everyday is an Adventure" has inspired countless crazy antics like lake biking, chair skiing and trampoline dodgeball - all in the name of fun and why the heck not? So we're throwing down the challenge to invent your own sport! Make a good one and we'll hook you up with hundreds of dollars worth of clothes! We want to see some creative new sports from you. The games can be variations on existing sports, but they need to be original. To enter the contest you need to explain how to play the sport to and how to make any custom equipment, if needed. A video showing the game in action is a major bonus, but not required. Gas prices have gone way up, Mini's are sold out for 2009, so bike commuting is getting more popular and summer is coming to an end. Which means it gets darker sooner. Clipping a NiteRider TriNewt to your bars means only one thing, daylight at night, plain and simple. The battery is big and can hold a charge for over 3.5 hours in full mode. Even the old systems from the 1990 are still going strong. If anything breaks just order up a new part. The TriNewt was designed with cycling specifically in mind. As a result, no ‘off the shelf’ optics are used in the TriNewt.Instead the 3 high-powered LED’s are housed in a custom made reflector to deliver a beam pattern ideal for night riding. The TriNewt incorporates a cluster of 3 high-powered LED’s to achieve a retina searing real world output of 500 lumens! The TriNewt uses a Borofloat lens to greatly minimize light loss, when compared to a traditional glass lens or total internal reflector. A wireless remote version of the TriNewt is available, allowing light control without your hands ever having to leave your handlebars, regardless of where you are mounting your light. This added layer of safety is not found anywhere else. All of these features, combined with regulated run times ranging from 3:30 – 7:00 HRS and a lightweight Li-Ion battery, make the TriNewt the light by which all others are judged. Now you have no excuses, light is 24/7. Hey soccer is fun and warming up to your own iTunes library is everyone's dream no matter what sport you do. Well rain or cold weather come hand and hand in England so this type of Jacket was just a matter of time. Soccer, fashion and your music, it doesn't get any better than that. The iPlay jacket is made for iPod and with the finger tip controls you can combine all your moves on the field with the music that you love. This is one of those gotta have products that has you standing out in a crowd. By retaining the temperature longer than other products, the Arctic Heat Cooling Vest can provide a significant advantage to the athlete or worker subjected to potential heat stress. High-rises are tough to get out of in an emergency, this is only a design but what a relief it would be if you live in New York to have The Wizard stashed in your closet. “The Wizard” was dreamed up to make the high-rise lifestyle a little less scary by providing a quick exit in an emergency situation. 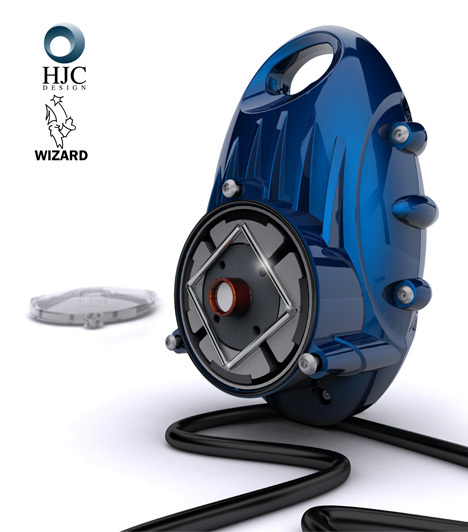 The Wizard “caters for this necessity by providing automated public safety solutions with up to 250m of reciprocating lifeline technology. Even if you don't have one the New York Fire Departments should. High tech solutions for keeping your keys. Employs the same technology that is used in PFD, once the sensor get wet and the balloon inflates. It can hold up 2.3 pound, hey that's a small dog or cat. Whoever thought that putting a Band-Aid on a cut was so difficult. Well the makers of the IntelligentFirstAid must have seen a need. The IntelligentFirstAid "talking" kit, designed by medical and educational experts, combines supplies, visual instruction cards and now an audio module for verbal guidance to manage the most common injuries, at home, at work, or at play. Well things just got easier in our very complicated lives.